I went to Washington Square Park to hear why Rachel Barnhart is running for the New York State Assembly. But also to get the story of her “underground” newspaper The Marshall Message (1993).The Message and its saga — a snapshot of Rachel at 17 — offers a small picture into the woman Rachel would become. Having given up her television position to run for office, Rachel is pursuing her lifelong passion for public service and social justice. 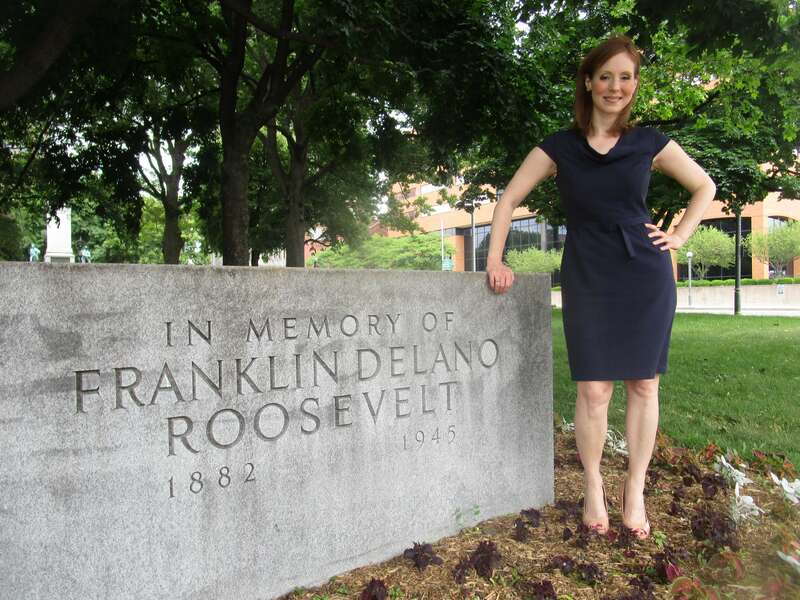 Fundamentally, Rachel believes she brings to the job the skills and mindset honed in her career as investigative and activist journalist, especially through her personal blog, The Rochesterian. To get the facts right and to uncover what’s really at stake in an issue. And — when appropriate — to take a stand, as seen recently in A Threat To Local Media and SUNY Poly Folly. Right now, we are not endorsing Rachel or her opponent in the primary, Harry Bronson, who has served ably as a State Legislator. We’ll let the voters decide. But for someone who started his own magazine (and published the ill-fated Weekly Wiffle News at Brighton High School), the story of an underground student newspaper 23 years ago is compelling. Controversies aside, Rachel’s creation of the Message itself is admirable. 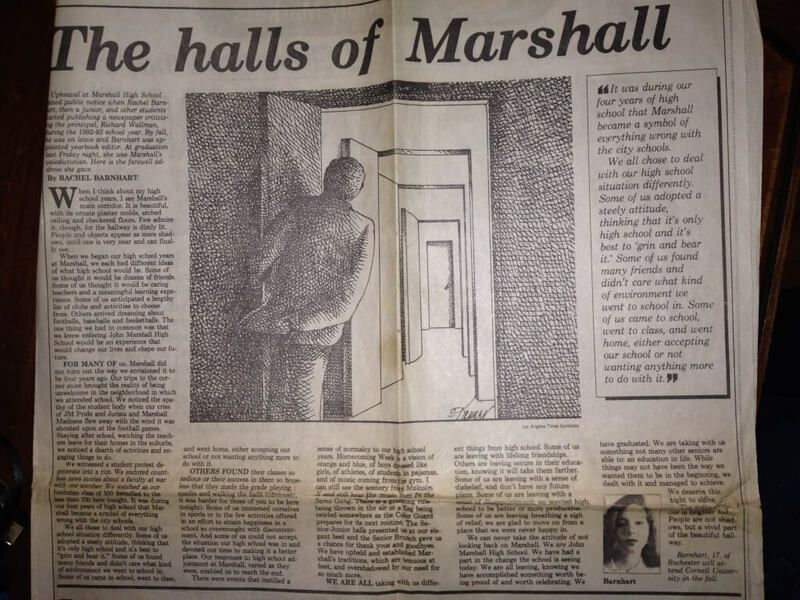 In 1993, Marshall did not have a student newspaper or literary magazine. Apparently, the newspaper — authored by another student John Campbell in Rachel’s suspended absence — was read widely thoughout the school, perhaps the first time students saw the power of the press up close: peers exercising their free speech rights. And, according to Rachel, 100 or so of those students exercised their own free speech rights by taping copies of the newspapers to their clothes. Many students perceive the beating up of white students to be their only means of recognition, their only way to get someone to listen. 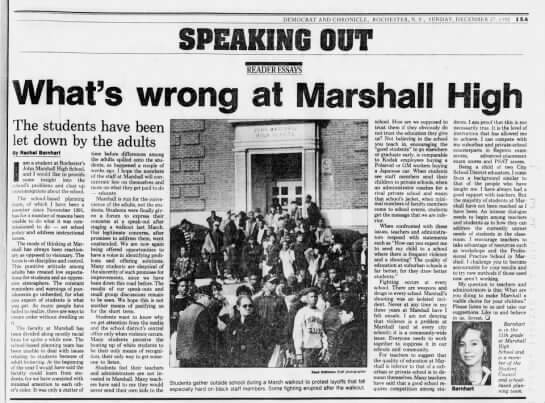 During the 1992-93 school year, Marshall Principal Richard Wallman was under increasing pressure based on Marshall’s poor overall outcomes. Rachel would choose to draw more attention to student views on suspensions by writing and circulating within the school, The Marshall Message, produced on her home computer, habitually running out of printing toner. Rachel believed the views she expressed on behalf of students at the school-based planning sessions were falling on deaf ears. As described by D & C‘s Lee Krenis More in “Marshall Law,” what followed was a complicated back and forth between Wallman and the newspaper writers as to how they could gain his approval. Wallman had the right to ban inappropriate student publications distributed on the Marshall campus. In the process, Rachel was suspended for 5 days, later lowered to 4 days by Superintendent Manuel Rivera. As a telling example of the complex racial world of the school, Wallman said one of his concerns was that a black student complained that a white girl, Rachel, was defying school rules and not getting punished. as now — the best way to spread the news is bringing it directly to the masses, in this case the school cafeteria and the hallways of Marshall. 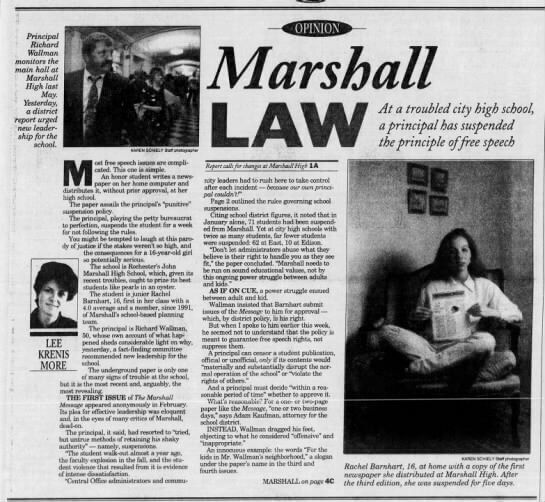 Ultimately, Wallman would leave Marshall for medical reasons and not return; there is no way to know how much his handling of The Message was a factor. Later — as reported in the D & C — Rachel was nominated for the National Honor Society but voted down by the Marshall faculty. The D & C also gave a Thumbs Down on the decision. By her 1994 graduation, Rachel was “rehabilated” — or better — had proved her point. As Valedictorian, she gave a Farewell Address (reprinted in the D & C). The Address did not mention The Message. I’m not sure I could have given a different speech, though 20 years later, there are some things I wish I could add. I would add that the experiences we had were not the fault of individuals running our schools, but a broken system. I would add that I had some wonderful teachers; I didn’t score highly on my Regents and AP exams without their support. I would have said thank you to my parents. My teenage self was talking about educational inequality, though there was much about it I had yet to learn. I knew something wasn’t right about my school. Watching so much human potential go unrealized remains a very painful memory. What would 17-year-olds say today? And her defenders. But Susan perhaps displays some slight maternal bias. Barnhart’s suspension was not her first. Last fall she was caught skipping school and was suspended for two days. Earlier this year, she was suspended for another two days after she argued, heatedly, with Wallman over a disciplinary policy. Vulgar? I asked. “No!” She seemed shocked at the suggestion. Oh wow!!!!! I have no idea!!! I for one cannot imagine Rachel other than demure and soft spoken. And the thought that a vulgarity may have slipped through her pristine lips is as astonishing to me now as it was to her back then. So take from the saga what you will. 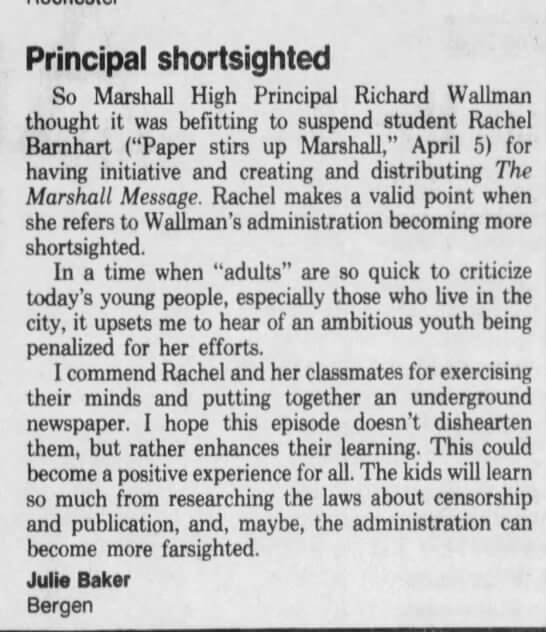 You can say (or not) that the D & C adopted and dramatized Rachel’s story because of its own investment against any censorship: the headline in More’s story, the Thumbs Down, a follow up piece on the National Honor Society, and then reprinting her Farewell Address. You can admire Rachel for her rebel mettle or think she unduly stirred a pot that was already churning enough. But I’ll give a Thumbs Up for the message in The Message. But no endorsing yet. POSTSCRIPT: Rachel reports that the original copies of The Message are — for now — irretrievable somewhere in her mother’s overstuffed garage.